If you follow garage sales, tag sales and the like, you'll find that the cellars and garages of America are full of old, cheap tandem bikes, which can often be purchased for next to nothing. Bikes of this sort have various deficiencies, in durability, handling, gearing and, most of all, braking. These are not serious tandems, they're built for very casual riding on flat terrain. Typically they will have one-piece cranks, skinny frames and cheap parts. Most of them will be one-speeds, though a few of them will have two-speed or 5-speed gearing. Most folks in the industry sneer at these relics, but if you're handy, they can be fun projects. Above all, one of these tandems, suitably upgraded, can work well for a parent who would like to ride with a child stoker. Some of these bikes are more suitable than others for upgrading. Frame design and wheel size affect the suitability of these bicycles for upgrading. Most of these tandems, like the one in the photo above, have a rear top tube which slopes down from under the front saddle to the middle of the rear seat tube, and a mixte rear, with three sets of stays extending from the rear seat tube to the rear dropouts. The middle set of stays meets the rear top tube at the middle of the rear seat tube. Other frames have no middle set of stays. These frames are weaker and more flexible. Most of these tandems had 26" x decimal (ETRTO 559 mm) tires. This is a very common size, the same as on most mountain bikes. Some of these tandems had 26 x 1 3/8" (ETRTO 590 mm) wheels, same as on old English 3-speeds. The richest source of good used wheels is in the mountain bike size. Wheel upgrades will be described later in this article. One of the nicest things to do with one of these old bikes is to adapt it for a child stoker. With a "mixte" style rear end, if you pick up your hack saw, chop off the upper set of stays and cut the seat tube a couple of inches above the middle stays, you can adapt the bike to fit a much shorter stoker. You'll have to arrange a way to secure the rear seatpost -- usually, by slotting the back of the rear seat tube tube and using a clamping collar. The handling deficiencies of these frames mostly disappear when you have a small child in back, especially low down. This is often a quite worthwhile modification. A small child will also need lower and closer handlebars, and shorter cranks. We have another article with more information about riding tandem with a child. If you come across a Columbia tandem with an Arai drum brake in the rear wheel, well, you're in the money. This is the classic drag brake for a tandem, suitable even for speed control on long downhill runs. But most cheap tendems will have been supplied with a cheap front caliper brake and a coaster (back-pedalling) brake in back. This is pitifully inadequate if the bike is to be ridden much faster than a walking pace, or anywhere that isn't dead flat. The drivetrains on these bikes rely on a flimsy chain tensioner for the synch chain, and it is generally all too easy to accidentally derail the chain. This, of course, instantly renders the coaster brake totally inoperative. If such a tandem is ridden with nobody on the back seat, or with a lightweight child in back, there won't be enough weight on the rear wheel to provide traction for the coaster brake, so even if the rear wheel stops turning, the tandem will hardly slow down at all. Applying a coaster brake on a tandem requires the cooperation of both riders. This is not practical when emergency braking is required. A coaster brake can overheat on a downhill run even on a solo bike. On a tandem, with more weight, the problem is much worse. A cheap tandem with derailer gearing (usually, a five-speed) will usually have front and rear rim brakes, but these are usually weak long-reach caliper brakes. These need to be replaced if the bike is to be put to any serious use. Any tandem needs good brakes front and rear. Speed control downhill requires a large drum brake or disc brake, to avoid overheating rims and blowing out tires. More detail is in our article about tandem brakes. The frames on these bikes are generally pretty wimpy for tandem service, but not as much as the forks. Many of these tandems have flat-blade forks that have very little lateral stiffness, which leads to very shaky handling. They typically use the obsolescent American 21.15 mm handlebar stem diameter, and they generally have pretty crummy handlebar stems. If you want to upgrade or just to get a stem that provides a more comfortable riding position, it will be hard to find anything that will fit the narrow steering column. All is not lost, however! There's a fairly easy way to fix all of these problems! Look for an older used mountain bike from the '80s or '90s with a rigid (non-suspension) front fork...and transplant parts! Older mountain bikes generally had very sturdy, stiff forks. Just swapping out the fork will usually make a major improvement in the handling of one of these old OPC tandems. In addition, you'll get a nice powerful cantilever front brake instead of the pitiful long-reach caliper from the original bike. Most cantilever brakes work only with the one wheel size for which the fork was designed, but with older mountain bikes, that is usually the same 559mm size as on most cheap American tandems.. If the tandem originally had 590 mm wheels, you could install the fork from an English 3-speed bike. You will then have to use a front caliper brake. A good dual-pivot or centerpull brake can improve stopping distance markedly. . Or use the fork from a hybrid bike, which may have mounts for a cantilever brake. There are differences in the headset parts of the OPC standard stuff vs sizes used on other bikes, so you will most likely wind up using most of the original headset parts, or else buying a "BMX" size headset. See my Headset Cribsheet for relevant dimensions. If you have cannibalized an older mountain bike for the front fork, you might take the upgrade a step further and use the wheels too. The aluminum rims used on decent-quality mountain bikes will improve braking. Avoid low spoke-count wheels. 36 or more spokes are best. Usually, you will have to spread the rear dropouts if you are upgrading to a mountain-bike rear wheel. Old American tandems have steel frames, so this is practical. Instuctions are in our article about frame spacing. If the bike had 26 x 1 3/8" (ETRTO 590 mm) wheels, one viable option is to use the rear wheel from an old English three-speed. This will upgrade a one-speed bicycle and can be satisfactory if the tandem is used in moderate terrain. See our page on internal-gear hubs for further advice. Do not, however choose a three-speed hub with a built-in coaster brake or drum brake. 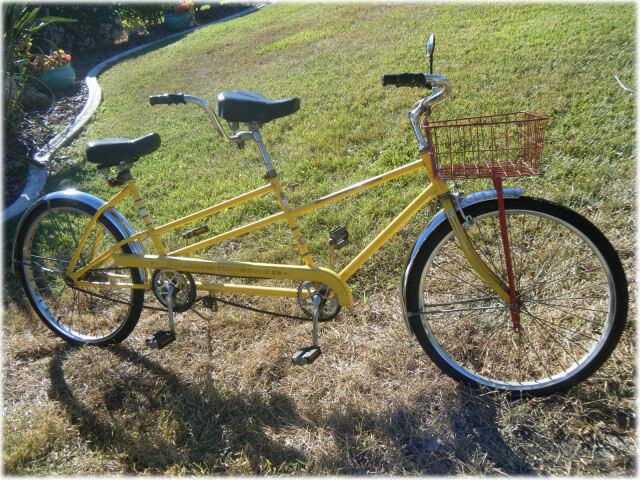 These are not adequate for tandem use. You should at least install a good caliper brake. Tires and aluminum rims in the 590 mm size are still available. New rims are going to inflate the budget though. On a bicycle which had ETRTO 590 mm wheels, you could fit 700C (ETRTO 622 mm) wheels if there is enough clearance. These wheels are very common, and will allow you to use shorter-reach, more effective rim brakes. Typically, these tandems have a chain tensioner on the right side, for single-side drive, and you can't use a special tandem crankset with the synchronizing chain on the left. You may, though, replace the rear crankset with one from a mountain bike, with an adapter for a square-taper axle in an Ashtabula bottom bracket. The rear crankset must have at least two chainwheels -- one for the synchronizing chain which goes to the front crankset. The chainwheels need to be spaced far enough apart so the two chains don't interfere with each other. The synchronizing chainwheel needs to have the same number of teeth as the one on the front crankset, also the same chainline as that chainwheel and the idler. You could replace the front crankset as well, to save weight and to match the rear one. A mountain-bike rear wheel usually comes with a sprocket cluster for derailer gearing. You will need to add a shift lever, cable and rear derailer with an adapter claw. You might also install a front derailer, and a crankset with three chainwheels, or even four chainwheels. Crankset options are described here.